Next in our spotlight of our amazing volunteer team we have Jamie Parker. Jamie is both our Rescue Dog of the Week coordinator and one of our community managers, so probably a familiar voice to many. When Jamie first started volunteering for us I knew right away that with her goofy personality and passion for both pit bulls and dogs in general she’d fit in perfectly with our core team … and needless to say I was right (I love when that happens)! In three sentences or less, how did you become a pit bull person? I first became a pit bull person approximately five years ago when I learned how amazing this breed is, and when I stopped believing the misinformation of the media. 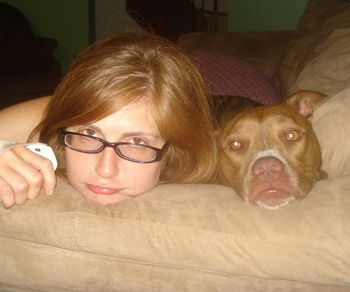 Through my volunteer experience, I realized I couldn’t fight hard enough for pit bulls. I have a master’s degree in community counseling. I worked in the mental health, non-profit sector for approximately 12 years. When I am not working for StubbyDog, I spend my time as a wedding consultant. In addition, I work as a pet loss therapist providing therapeutic services to individuals and supportive services to non-profits. What do you love most about volunteering for StubbyDog? 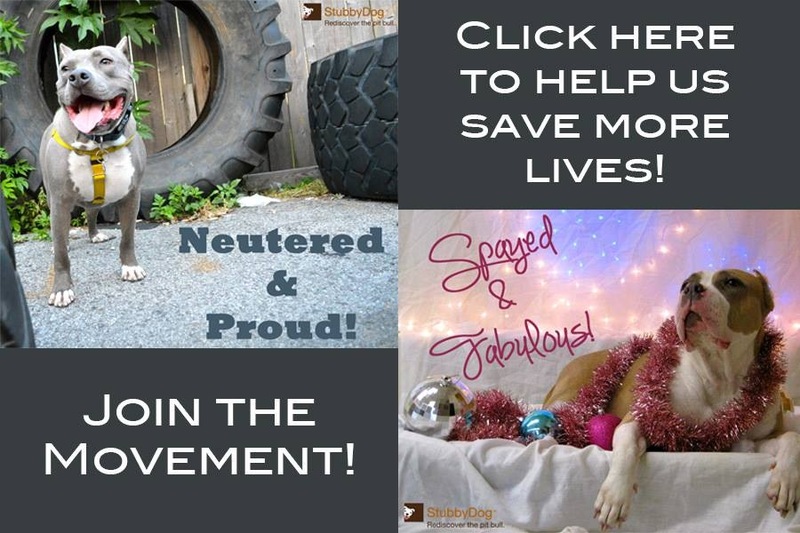 By volunteering with StubbyDog, I am helping to impact individuals and communities which is ultimately making a difference in the lives of pit bull type dogs. I love that as Stubby we really try to build relationships with our fans and with other non-profits. What pets share the house with you? I guess I am the crazy dog lady of the Stubby crew- I have 5 dogs!. Bandit, 15 year old Brittany Spaniel mix, I found neglected, emaciated, and shot in the woods. 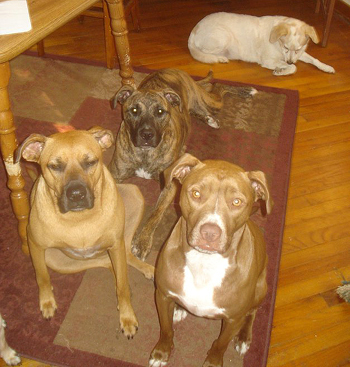 Bumble, American Pit Bull Terrier, who is 4.5 years old, Lola, a Boxer- Labrador mix who will be 4, Moxy, a pit bull mix, who is 3.5 and Hank, a Labrador mix who is 1.5. Tell us about your first experience with a pit bull? I started volunteering at a shelter in my community. 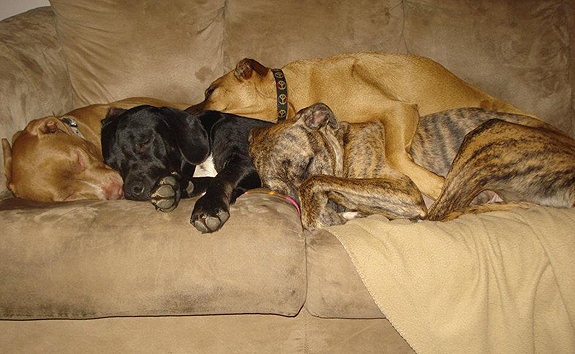 The shelter is usually 97 percent full of dogs labeled as pit bull type dogs. When I first started volunteering, I was terrified of pit bulls. I had never seen one but I believed the media hype. The kennels in the shelter have concrete walls and floors, and are enclosed in chain-link. You can imagine the noise of walking into a kennel with 18 dogs gnashing at the metal, barking, all vying for attention. I wouldn’t walk any of the pit bulls. I wouldn’t even think about it. After volunteering for two weeks, I realized how much they needed attention, how much they needed someone to give them a chance, and to give them a break from the kennel. I asked one of the workers to help me take a PIT BULL out of a kennel. I don’t know what I expected, but I certainly didn’t expect to fall head over heels in love. I didn’t expect to have my heart completely stolen! I walked Serene, a beautiful chocolate brown pit bull. We spent time lounging in the grass and in the sun. She showed me that pit bulls are just dogs. What’s one thing your dog does to really crack you up? I have a house full of clowns! And each one does something to make me laugh every day. If you could tell everyone in the world one thing about pit bulls, what would it be? They will change your life in ways that you never thought possible. What’s your hometown, and where do you live now? My hometown is a very small, rural town, Sarver, which is located Pennsylvania. I currently live outside of Pittsburgh, PA. Which StubbyDog story has made you cry the most so far? Ahh, this is a tough one! I have to say for me, Dear Enzo was by far the most emotional story for me to read. I think it took me close to 45 minutes to finish reading the story because the tears just kept streaming down my face. I respect Enzo’s foster mom for having such amazing unconditional love and devotion to Enzo. What’s your favorite thing about our StubbyDog fans? I love the positive energy from our fans. I know they care just as much about pit bull type dogs as I do. When I read through the comments on Facebook or receive an email, I can hear the passion and devotion. As a community we have a strong sense of togetherness, and I never feel like I am doing this alone. Good dogs and the people who rescue them are good people. Thanks everyone for the awesome compliments! I am so proud to be a part of the StubbyDog community! All of you ROCK! I just read Laura’s latest blog post. Thanks for what you shared.